Hello girls, aren't you glad it's the weekend?! 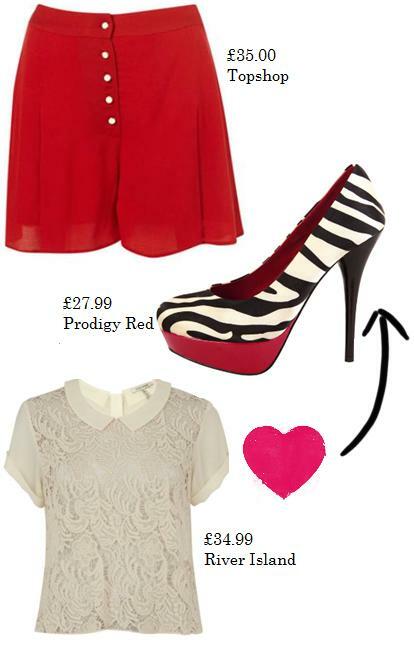 I think my favourite item of this outfit has to be the zebra court platforms. They remind me of Louboutin's - but minus the price tag. Kelly recently got voted the best bikini body out of 2,000 celebrity's and I love that! It's really refreshing to see a women with real curves, who is proud to show them off! Love those shorts, their amazing! I love those pieces especially those shorts! Love the shoes! You can never go wrong with zebra print. Arrrr thanks for all the comments girls! This outfit is pretty yummy isn't it? I need those zebra heels! Love the zebra print shoes. I love animal print but how much is too much? I think the saying "everything in moderation" applies to animal print. You just need to learn to balance out patterns with simple colours.